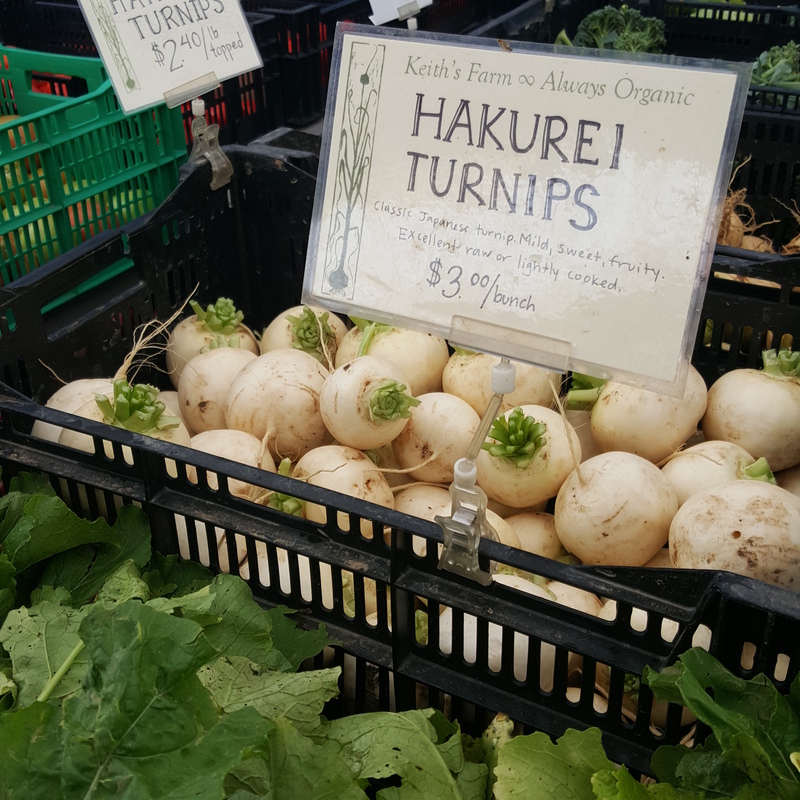 I bought some huge Hakurei Turnips from Keith’s Farm at the Union Square Greenmarket this morning. They have topped ones (sold by the pound) but also ones with leaves (only $3 for a bunch and they were huge!). I’ve always loved turnip leaves (especially in soup) so I opted for the $3/bunch option. My first stop at the greenmarket is usually PE & DD Seafood, where I get whole flounder, squid, conch, whelks or sometimes cooked lobster. I had already gotten some squid so I decided to make something with turnips and squid. After Keith’s I stopped by Norwich Meadows and saw a variety of shelling beans. I’ve never cooked fresh shelling beans before so I grabbed some Calypso Beans. Place the beans in a pot covered with an inch of cold water. Bring to a boil then reduce to a simmer and cook until tender (shouldn’t take longer than 15 minutes or so). Drain and cool. Combine the chopped turnip stalks/leaves and turnip skin and salt with a large pinch of sea salt. After 15-20 minutes or so they will wilt down and release some water (this is a Japanese quick pickling method called “asazuke”). Add the chili flakes and cooked beans and mix well. Char the turnip on both sides without oil on high heat (inside should be tender and juicy) and place in a bowl. Sear the squid in a pan without oil on high heat, and add to the turnips. Toss them together with the sesame oil, soy sauce and scallion, and season to taste with sea salt (if necessary) and black pepper. Finish with a generous squeeze of lemon juice. 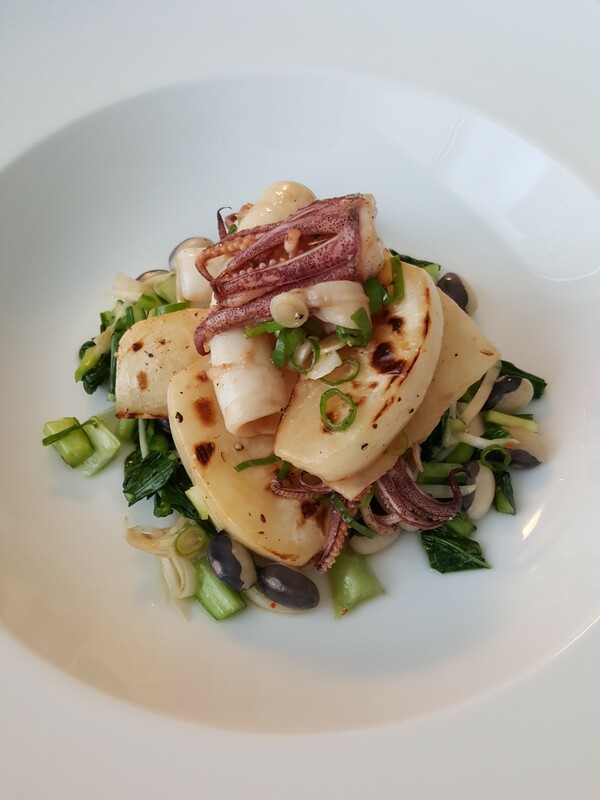 Plate the turnip and squid over the turnip leaves and beans.